Mohammad Sadegh Larijani the head of judiciary power on execution of two:The rule of the law of indictment was carried on the recent sentencing! who is lying , the head of judiciary Mr. Sadegh Larijani or Ms. Nasrin Sotoudeh the lawyer of Arash Rahmanipour , who said : As a lawyer of Arash , i was not allowed to participate in arash's trial. She said: Even the father of Arash wasn't present on his son's execution.The father said: The regime didn't give the body of his son. According to ILNA ,Mohammad Sadegh Larijani the head of the judiciary power in a meeting with the officials of judiciary said: On the sentencing of the members of combatent group : Those who have received their sentencing and their execution were carried out were member of the combatent and terrorist group who were armed and were arrested with explosives and the rule of law of indictment were precisely followed and carried out. Mr. Larijani's brother , Mohammad Javad Larijani the head of the human rights commission was also present in the meeting. Iranian are going to bring world attention to Iran again with their protests! Karubi and Mir Hossain Musavi two leader of the green movement and the two presidential candidate have met and condemned the execution of the two innocent young Iranian protesters, They also called people to continue their peaceful protest on the coming of Feb. 11 and they have said ; they will participate . the websites and blogs are full of news and support for Karubi and Musavi and the coming of natiowide protest on February 11. The green Iranian abroad in support of green movement in Iran protest an organized music show of the regime of coup d'etat in Netherland ! New poster -10 days and nights struggle against dictatorship Feb1-11.Participate in the national referendum of Iranian . The struggle for civil society must continue with awarness.This struggle shouldn't be a blind one ,there should be wisdom and rationality with it.We are not for just changing one ruler with another but we are going to change the mentality /minds of the people in understanding their human rights, for not to fear, build their self confidence. This struggle must be for nation building. Iran must be for all Iranian. A free society . Awarness that the judiciary system must be separated from politics. That the execution/death penalty must be abolished, there shouldn't be political prisoners for what so ever.while the struggle continue , the social networking and small NGO group must be established for various socio-economic and cultural phenomena's and resistance & mobilization against the regime of coup d'etat. People are preparing themselves for the 40th day of passing away of Montazeri on February 9,in many city's including Qom,Isfahan,Najafabad....... .
Ayatollah Ahmad Jannati in Friday prayer: The judiciary power must act decisively against rioters(peaceful protesters) as in hanging the two ! 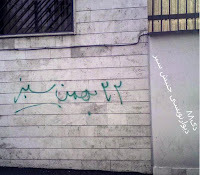 Ahmad Janati to Mohammad Sadegh Larijani: Kill all the rioters ! Ayatollah Janati is the secretary of the "Gurdian council" which overlook into the candidates and election and the temporary imam of the Friday prayer in Tehran. He is a radical moslem cleric and anti reform/change or green movement . In his todays friday prayer he asked Mohammad Sadegh Larijani the head of judiciary power to act decicively and execute all rioters like the two men that were hanged few days ago.He asked Judiciary power "not to show weakness' and if you show of weakness you will expect worse". Karubi: Ahmad Janati is a traitor ! Mr. Karubi a leader of change and green movement called him a traitor to the interest of the people because of his position in the Guardian Council overlooking into the election and ignoring the cheating in the presidential election and approving Ahmadinejad as the winner. Show the bodies of the executed round the city ! the regime of coup d'etat backed by Khamenei hanged two young Iranian this morning! Thousands of protesters during the eight months of protest in Iran have been arrested and detained in jails by the regime of coup d'etat and among them 11 have been sentenced to death by kangaroo court and this morning two of the detainees were hanged. These two young men were Arash Rahmanipour and Mohamad Reza Alizamani . The appeal court had approved the sentence.The other nine people's are still waiting for the appeal court. If appeal court approve those cases , they will be hanged as well. Their charges are "war with god" or "Maharebeh", "Trying to topple the system" and membership in Monarchist Association and Mojahedin Khalgh. According to "Jeras news online" after the sentence was carried out , the prison offficials didn't informe their parents about the execution. Ms. Nasrin Sotoudeh the lawyer of Arash in speaking with "International Campaign for Human Rights in Iran " said: The father of Arash who was in contact with me until todays lunch time didn't know about the execution . The execution were carried in secret. the law says ; the judiciary must inform the family if the death sentence is going to be carried .She said ; she was shocked by the sudden execution and death of Arash. The lawyer said: Arash was arrested in his home two months prior to the presidential election in June 12 and he was 19 at the time of arrest. He was under alot of pressure , first they arrested his sister and she spent two months in jail. She said :In a meeting i had with Arash for 15 minuits , Arash said: In the prison , the prison officials brought my sister in front of me and asked me to confess and if not , they will keep her in jail. she was pregnant and as a result of stress and pressure she lost her child. Ms. Sotoudeh the lawyer said : As a lawyer of Arash, i was not allowed to participate in his trial. Arash Rahmanipour's confession in Kangaroo court.Confession under torture has no value.He was hanged today. His lawyer and parents wern't present. Rafsanjani in response to Mohammad Yazdi: "There is a smell of conspiracy". Khamenei is in deep trouble . for the last eight months he had several talks with the Iranian people. After his first appearance on Friday prayer right after the election cheating on June 12,2009 he shamelessly supported Ahmadinejad and called the presidential election a clean one and asked the officials to support Ahmadinejad. Today he again spoke and asked people to " trust officials" . Now , if there has left any trust, not only to officials like Ahmadinejad with his big lies , but to make it short ,people dont even trust Khamenei. Yesterday Mohammad yazdi a radical anti green movement cleric spoke ill against Rafsanjani . He criticized Rafsanjani for not clearly taking position against green movement. today Rafsanjani came out with a clear message , he said:"There is a smell of conspiracy " . In the meantime, Mr. Karubi former parliament leader and a green movement official said: "I would never negotiate on the rights of people". "We won't recognize the Government and we won't negotiate". The Banks are falling freely, the national economy is collapsing , people are affraid the officials will take their money and leave the country , so they have lined up to withdraw their money from the banks. clashes are reported between the bank officials and people. Another diplomate Mr. Abolfazl islami the consul in the embassy of the Islamic Republic in Japan has resined and apparently has joined the green movement and asked his colleagues everywher to join the green movement. People in green movement are preparing for the nationwide protest and strike on the coming February 11. Major talk of the people has gone bake to " Give back my vote " and "Free presidential election". Count down for the upcoming February 11 (revolution day ) nationwide protest ! despite of continuous arrest and imprisonment of close to 10,000 men and women from all walks of life ( report indicate that the regime lack space for new prisoners in Evin and other prisons), the green movement has prepared and distributed posters which calls for count down from february first to Feb. 11 as a nationwide protest.As usual they will continue their protest at night by chanting slogan on the rooftops and scattered protest in Tehran and other cities up to Feb.11 which will be a day of nationwide protest. The economic situation is on the free fall and the regime is unable to manage the situation .Because of instability and the situation, people are withdrawing their mony's from the banks and regime in a hasty decision banned anyone who withdraw more than 15 million Tuman ( $15,000). Regime's bank officials also warned about money laundering. In the meantime, the new money printed didn't stop people of writing freedom slogan on the bills. Again in a hasty desision regime asked the shop keepers not to accept mony's that have slogan on it. This policy will fail because, if the shopkeepers dont accept mony that have slogan, their sell will sharply drop. Daily news indicate that someone has defected in foreign soils. The news today said ; a weight lifter from national team asked for asylum in Sweden. unrest and strike among workers is also growing. The difference between import and export is 20 billion Dollars. The GDP in last year was 2.3 percent. The jobless is 22.5 percent. The income of 9th Government was 370 billion Dollars. We thought at least 180 billion dollars would be left in the reserve fund, but he said: There is no money left in the reserve fund . Regime continuou to murder the protesters in prisons. The lives of many prisoners are in great danger. The Islamic states must reconsider their relation with Islamic Republic or show their Moslem people that; they have differences with Islamic Republic or the way the Islamic Republic is handeling with the situation and its own people. Sooner or later those countries that have close ties with Islamic Republic or have supported the Islamic Republic in any ways during the national uprising, which is going on for almost eight months,must answer to its own people that; why and for what reason they didn't change their policy with a regime that suppresses their moslem brothers and sisters? In recent months there are little changes in policies of some moslem countries including Syria. Their has been some changes also in the policies of Hamas.Not clear if it is going to reconsider its relation with the Islamic Republic , a regime that is clearly unstable, will fall sooner or later and suppresses its own people and it brings more crisis not only to the region but the whole world. The Islamic states must decide whome going to support , Ahmadinejad's regime or the green movement , the Iranian people's movement for democracy and human rights ? Islamic countries must know clearly with what kind of regime the Iranian people dealing with!Islamic states must cut tie with Islamic Republic! First court day of 5 Iranian held today under Judge Salavati.Regime named Bahai's,monarchists,Mojahedin,seculars as the "seditious" or rioters. the Mafia of power - Corruption in Iran among Islamic Republic officials! The world political conscience await what is going to happen in Iran after 7 months of protests ! The whole world were watching when "Neda" the young Iranian woman for freedom in Iran brutally and savegely gunned down by reppressive regime of Ahmadinejad . She died infront of the eyes of millions of people around the world. The whole world watched and are awaiting to see what finally comes out of the struggle for freedom in Iran. The people in Iran , young and old must combine their mind and action together and not to forget that the most important part of their struggle is not only to replace this regime with another unknown and yet reppressive regime but instead they must focus their struggle to bring cultural and social change and to increase people's capacity from the bottom and top as well. This struggle is all about nation building while continuing to pressure the regime to give up its reppresive nature and bend to the demands of the people. Changing the regime won't do any good if replaced with more repressive one, instead we must change the mentality of the people . Civil disobedience and encircling the regime with civil rights actions should become our ultimate goal. We must remember that: Any of our action will breed same action.therefore violent action will breed violence. As cervantes put it in Don quixote: "Like give birth to like " . But struggle must continue for freedom. At home with internet social networking and in the street with slogan and protest against the most brutal and medieval regime of Islamic Republic. As the people correctly are planning and organizing for a national day of protest on February 11 ,2010. The regime will continoue to arrests,imprison or murder from among you and that is certainly because of their fear from your struggle and no struggle comes out without expenses. 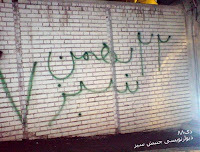 Picture shows slogan on the walls for that day.One slogan says: On Feb. 11 we will make the whole Iran green! Ahmadinejad and green scarf !!?? Look carefully, isn't that green scarf heavy for his neck? In a recent tour to Khuzestan province , Ahmadinejad has used a green scarf . He is not only good for stealing the vote , he is good at stealing the symbole of green movement too and one more thing; he is good at lying. MP Ali Motahari: Remove the judiciary immunity of Said Mortazavi! Request by Ali Motahari for expediting the trial of Said Mortazavi the accused of crimes in "Kahrizak " prison. Said Mortazavi is also accused of murdering Zahra Kazemi the Iranian-Canadian photo journalist. According to the finding of MP's investigating the crimes in "Kahrizak" prison, where many prisoners of the protests were illegally trasferred , tortured and murdered , Judge Said Mortazavi was named as the accused behind the "Kahrizak" crimes. Mr. Ali Motahari the son of late Motahari the Islamic Scholar asked Mohammad sadegh Larijani the head of Judiciary power to remove the immunity of Said Mortzavi as judge and without delay put him on trial for commiting the crimes against prisoners.He said in his letter: "Based on the crimes commited by Said Mortazavi during his term as prosecutor which is proven by the 7 and 8 parliament,he must be brought before the law and put on trial without any delay." Despite of parliament delegate fact finding and naming Said Mortazavi as an accused of crimes in "Kahrizak" , Mahmoud Ahmadinejad ignoring the parliament and coming to his rescue , naming him as head of the task force of underground goods and foreign exchange , plus leting him keep his position as judge. What a country? What a parliament ? and what a Judiciary power???!!!!!!!!!!!!!!!!!!!!! Shirin Ebadi: The Islamic Republic regime is on its final days of political life! 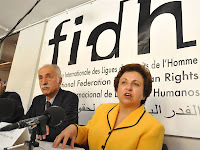 Shirin Ebadi the Iranian Noble Peace Prize winner and the president of the Association of Human Rights Defenders in Iran in speaking with Radio Farda said that : Islamic Republic regime is on its final days of political life. On November, In an attempt to silence Ebadi , the regime agents confiscated Shirin Ebadi's Noble Peace Prize medalion which was in a safe in the bank. On December, the regime agents arrested her sister and later they confiscated the passport of her husband who is still in Iran. According to Ms. Ebadi : The movement for democracy in Iran grew in all over Iran.The division among Islamic Republic officials are deepening and the secular and Islamist supporting the green movement are coming closer to cooperation. If this happens ,it will be great development. Ms. Ebadi emphasized that: The regime is moving more to become like the military regime in Burma and if this happens , the regime has entered to its final days of political life. New development :The regime of coup d 'etat and the dangerous game of assassination! Situation in Iran is rapidly changing. The count down for the regime of coup d'etat has started . a nationwide protest has been planned for Feb.11 ,2010. Khamenei-Ahmadinejad regime is playing cowardly. They have decided to terrorize innocent Iranian people by assasination and Lebanonization of Iran. The economy is in shamble. The fact the matter is, the daily news about the banks and their problems ; like the borrowers won't pay what they have borrowed. Regime have lost complete management of the situation they have created themselves. The regime of coup d'etat showed that it is unable to function at the time of political crisis. Regime has created new scenari for the green movement. This time they have decided to assassinate the prominent green movement leaders or supporters. Just in last week they tried to assassinate Mr. Karubi one of the leader of the green movement in the city of Ghazvin. Mr. Karubi's car was ambushed and two bullet was fired on his car, but since the car was bullet proof , no one was hurt. Regime also assassinated Mr. Musavi's nephew couple of weeks ago. Today regime has assassinated Mr. Masoud Alimohammadi a professor of Tehran University , a nuclear physist and a pro green movement and one of the 420 professors who have signed a pettition in support of Mr.Musavi. Regime in Iran is terrorizing the Iranian people. UN and all government that have respect for human rights must condemn Islamic Republic! Iranian people are preparing themselves for another nationwide protest on February 11,2010 ( 1978-79 revolution day) -What the regime can do? One week of political turmoil in Iran! Picture: Karubi's car was attacked by organized plain cloth agents. This last week the political stage witnessed both with expected and unexpected events inside and outside of Iran . Most political intellectuals believed the regime of coup d'etat backed by Khamenei and his childeren is like a wounded snake will jump and bite at any time. The unwanted regime of coup d'etat brings yet more instability in Iran and deepens the crisis for the Islamic Republic. This trends seems non stoppable and continued for the last while. The attack/assault on reform/change camp were intensified . Arrests and imprisonment increased in a way that it is hard to follow the names and numbers. hundereds of even seems thousands have been arrested from all over Iran. The prisoners are kept in a very harsh condition . Report coming from "Eshrat Abad" barrack prison is worrying the human rights defenders in Iran. Regime is arresting everyone it suspects . Regime also arresting family members of known human rights defenders particularly in the case of Shirin Ebadi , her sister is arrersted and her brother and brother in laws are threatened. Emad Baghi the head of the Association Defending Prisoners Rights is arrested. Many journalists were arrested and many newspaper and website were shut down. Regime in a recent attack on Bahai's has arrested 12 members of Bahai community in Iran. The world is also worried about the seven leaders of the Bahai arrested in 2008 .Their lives are only in the hand of UN and UN human rights council. In the regime camp: Said Mortazavi was named as the accused of "Kahrizak" prison . Rohullah Hossainian a pro regime of coup d'etat, a Tehran MP , a suspect behind the "Chain murdering " and a member of the ultra secret team of Ministry of Information together with "Emami" ( the agent that commit suicide due to revelation that he was masterminding the chain murdering) , resigned this week from parliament. His resignation brought many discussion among coup d'etat regime and green movement. The parliament is going to review his resignation this coming week. In another news: A member of the Iranian embassy consulate team Mr. Heidari in Norway resigned from his post and apparently joined the green movement. Last week , Mr. Mohsen Rezaei former commander of Revolutionary Guards and current member of the expediency council expressed an almost positive view from Mr. Musavi's 17th communique, this also brought discussion among both pro regime and green movement . The green movement encouraged his move but he was sharply attacked by pro regime think tank Ayatollahs. Yesterday Mr. Karubi former head of the parliament ,a presidential candidate and a leader of green movement car was ambushed in the city of Gazvin where he was about to address to a meeting. Gunmen fired two gun shot at his bullet proof car , the car glasses were shattered but he was unharmed , said his son. 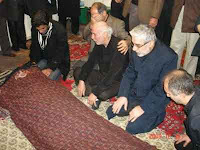 His daughter warned regime that if anything happened to her family members , the government will be responsible. One other important item of the week was,the appointment of Mohammad Bagher Zolghadr one of the leader of revolutionary Guard into the ministry of justice by Sadegh Larijani the head of Judiciary Power. This is unpresidented because it is happening for the first time and late ayatollah Khomeini has banned military personnel entering into politics and particularly now into ministry of justice. Is this the begining of the end of the Islamic Republic? The economic situation is not better but worse than ever. Banks are losing ground and with a lot of debt, they are almost unable to breath and statement after statement are released by bank officials. Iranian in support of green movement have staged protest in front of Islamic Republic embassy's around the world. Italian Government urged the European Parliament to voice their protest against the Islamic Republic for violation against human rights in Iran. A group of European Parliament members were about to enter in Iran , but apparently not permitted by the regime of ahmadinejad. In the meantime discussion continues among political scholars and intellectuals on the non violence discourse. The game between Iran -Singapore,Iranian chant pro Musavi slogan :"Ya Hossain ,Mir Hossain " - What regime can do? nothing. Finally , after several months , the parliament found the former prosecutor Said Mortazavi guilty of crime he commited in "Kahrizak " prison ! Finally , "mountain gave birth to a mole" and the parliament's delegate investigating on "Kahrizak" prison , (where perhaps hundereds of Iranian peaceful protester were jailed and tortured brutally to death) today Wednesday January 6 found Said Mortazavi the former Tehran prosecutor as guilty of negligence. Said Mortazavi was ordered to the post of Kahrizak by the head of judiciary power .Last Sunday the founding was approved by the parliament. Said Mortazavi is a known face, what about the others? Why do they protect the others? Now, the parents of those who were murdered in Kahrizak prison must go after Sadegh Larijani the head of the judiciary power who must take responsibility as the head of the court and prison system in Iran. The parliament must then according to the demands of the family and relatives of those murdered must bring an investigation against the head of prisons / prison officials and others including Hossain Taeb and Radan and others. This investigation must continue to the top and Ahmadinejad and his cabinet as the head of coup d'etat government must face the problem . People's patience is limited . They want justice on the case and they have every rights to come to the streets for justice, justice for their vote and justice for those who have been brutally murdered in the hands of Islamic Republic militia's. NO justice ,No peace ! Think about imprisoned Iranian journalists. One of the few film from the day of protest in "Ashura" . People have attacked on Basiji Militia's ! Musavi's 17th communique brought hot discussion inside and outside Iran among intellectuals and political parties as welll as human rights NGO's. In a way i wanted to say Mr. Musavi's 17th communique poured a cold water on a hot body of the movement. Was the protest getting out of the category of a civil rights movement?. Was it getting out of control? Were the people getting into violence? Some one suggested: Defending itself isn't "violence". Meaning, if someone uses violence to defend itself , that won't be considered the use of violence. Another one suggests: Defending itself isn't violence, it can be called resistance. So, it is just a vocabulary . Using violence to defend itself can be called resistance. Like the National liberation movements and so on. Most of the supporters of reform-change had supported Musavis communique by their joint statements and personal articles. Mr. Sahabi a prominent "Melli -Mazhabi " leader and a dissent voice to Ahmadinejad government wrote a letter to Iranian in exile and asked them to join the non-violent movement and oppose the use of violence. Mohsen Rezaei the former head of revolutionary Guards welcomed Mr. Musavi's initiatives. The radical Islamist supporting Ahmadinejad , the radical Ayatollahs and alike, all called for the arrest of Musavi -Karubi as the leaders of what they called " sedition". What is clear is that, the 17th communique insisted more on non-violence and a break for everyone to think and a chance for the regime to reconsider its decision to suppress the non violent civil rights movement of Iranian people. Iranian are sometimes like fire and sometimes like water and the movement since June 12 shows this proverb. As a result of the release of this communique , new way of struggle or protest is developing and strike by students boycotting their exams and classes is the start. Workers strike are growing, In this week the workers of "Alborz Tire" and "Mazanderan weaving factory" workers stopped working. For the fear of strike , regime has arrested workers leaders and teachers union leaders. Ahmadinejad's Government didn't only bring political crisis, it brought economic crisis as well. The engine of the protest at present are the young Iranian women and men. They are below 40 years of age. Most of these women and men belong to student and women movement or social networking. Iranian society has 3.5 million students and it has 18 million elementary and high school students.70 per cent of the society is young and the country has fresh and young blood. 65 per cent of university students are women. The economic situation of the country since Ahmadinejad took office went not only wrong but mad.The income of the government of Ahmadinejad in his first four year term from oil was 266.2 Billion dollar. The first five months of his 2nd term in 2009, had an income of 17 billion dollar. From the begining of the Persian year , the government didn't give any money it received by selling oil to the central bank. According to the central bank statistic , 19 per cent of the population are jobless. one fifth (1/5) of the population are living below poverty.Borrowing from the bank and debt to the banks are more than 40,000 billion Tuman (1Tuman is = 1000 US dollar) . The banks are having difficulties to get back the mony's it gave to borrowers. In short the banks are on the verge of collaps if they dont receive their money. 1- The Government must become responsive to the parliament and Judiciary Power and unnecessary support to government must be removed. Iranian inside and outside of Iran or in exile are busy discussing this issue this week and perhaps in the future. Right after the revolution with the establishment of Islamic Republic and the growing of dissent and soon the suppression of oppositions from within the Islamic Republic ( Bani Sader- ghotb Zadeh, Bazargan with wide range of thoughts .....)and from various political groups including Mojahedin khalq (which decided to challenge the Islamic Republic through arm struggle) and the defeat of all these type of struggle and approach,the political oppositions needed to choose new path to continue their struggle. needed to reform itself for survival or face the mounting pressure from society and people's revolt. From within the Islamic Republic, the seeds of reform was planted by few Islamic Republic scholars and officials such as Mohammad Khatami , soroush ,Montazeri and ....which grow bigger and bigger and from outside of the regime , the opposition brought disscussion on reform , civil rights - civil society and human rights dialogue. This period in Iran's history was infact the turning point . In 1996 -97 Mohammad Khatami with reform agenda- similar to Gorbachev was elected as president. He continued to reform the government and started a controlled oppeness in the society. Although he was challenged with the radical forces and officials of the Islamic Republic but people supported his reform. In his first four year term, he did what he could , because he believed in Islamic Republic and he didn't want to cross the red line . This belief and the opposition of radical element inside the revolutionary guards , the radical clergies, the radical elements inside his ministries including the Ministry of information brought his reform almost to a halt. But society could breath a bit more easier.In his 2nd term as president he was almost the same. His government became stagnant . during his presidency NGO's grow and the social networking and internet users also grow .